The concept behind the dining lounge bar RAIN in Toronto is to fuse dining and entertainment through its unique cuisine and spatial design. The chef and manager's vision was to heighten the experience of the diners by carefully designing the meals as well as the space in which the diners will enjoy their food. This thought process of enjoying the experience of dining not only with our taste buds, but through all our senses drove the idea behind the piece ʺForrest | Jyuʺ. 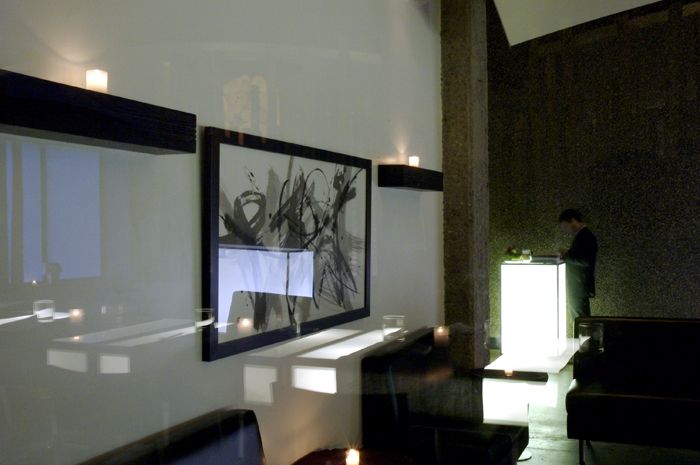 The piece played an integral part in this spatial entertainment in the main dining room, while emphasizing the chef's focus on the organic nature of their meals.